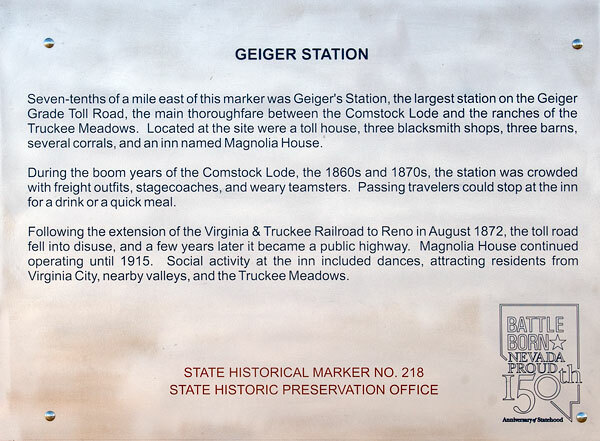 Seven-tenths of a mile east of this marker was Geiger's Station, the largest station on the Geiger Grade Toll Road, the main thoroughfare between the Comstock Lode and the ranches of the Truckee Meadows. Located at the site were a toll house, three blacksmith shops, three barns, several corrals and an inn named Magnolia House. During the boom years of the Comstock Lode, the 1860s and 1870s, the station was crowded with freight outfits, stagecoaches, and weary teamsters. Passing travelers could stop off at the inn for a drink or a quick meal. Following the extension of the Virginia & Truckee Railroad to Reno in August 1872, the toll road fell into disuse, and a few years later it became a public highway. Magnolia House continued operating until 1915. Social activity at the inn included dances which, attracting residents from Virginia City, nearby valleys, and the Truckee Meadows. 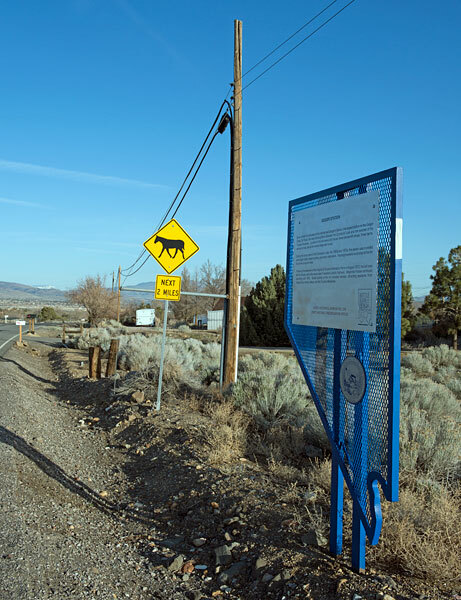 A highway sign picturing a riderless horse is a warning to motorists that wild horses are sometimes in the area.